el Coyotepe Fortress is in Masaya, Nicaragua, a few minutes drive from Granada. The Fortress was built in 1893 by President Zelaya and was used to observe enemies invading Nicaragua. A dungeon was built below the fortress during the Somoza reign and was used for political prisoners. 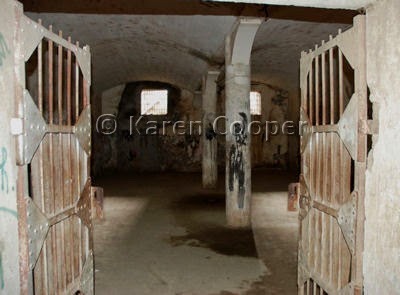 About 800 people could fit into the cells. There are also torture rooms here. No kidding. Pretty spooky place. It is pretty dark, quiet and cool below ground here. A strange kind of peace now invades this place. When I visited it, there were lots of school children laughing and playing in the sunshine above ground. Below ground there were spiders and the echoes of times past. I was glad to stumble my way back out into the sunshine. Places like this help teach us so much about life. How precious each and every one of us is. Even if others don't choose to see us in that way. How many souls lived and died here are beyond what I can wrap my mind around. Excellent blog! And your pictures are absolutely stunning! Absolutely agree with other commentators. Your photos are beautiful! Would love to see a photo of a Crollo team if you have one. Apparently Crollo is big in Nicaragua. love those doors though...too bad they are related to such horrors.